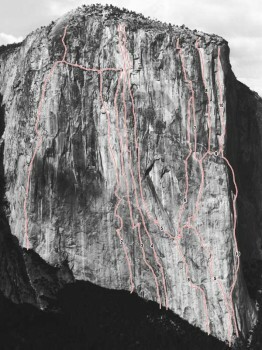 There are more than a hundred routes up the 2,900 vertical feet of El Capitan, but perhaps the most spectacular section is a thousand feet of apparently blank, overhanging wall on The Shield, to the left of The Nose. Looking up from El Cap Meadow, it doesn’t look as though there is any crack to cling to. Right up close there is indeed one little seam. I met up with Cedar Wright by pure chance. After getting psyched up to climb the Shield I got in my car and drove around Yosemite Valley looking for a partner. After an hour I finally spotted Cedar at the post office. I’d never climbed with him but he had just on-sighted Zodiac route on El Capitan in eight and a half hours, which is incredible. So I said, “Hey! Let’s do The Shield... now!” and the next morning at 6 a.m. we started out. The plan was for Cedar to lead the first 1,500 feet, until we got to the actual Shield headwall. I notice that he’s climbing without putting in protection pieces and I think, “What the hell is going on?” I yell up, “Throw in a piece of gear” and he says, “Oh, yeah. OK, sure.” and he throws in once piece and then he keeps going for another 50 feet. I yell up, “Say, you want to throw in another piece?” And he says, “Uh. Sure.” Would he ever put in gear if I didn’t remind him? I was blown away. I’m used to moving fast, but I know I’m doing this over the course of many hours so I’m going to go at a smooth pace. And he’s practically jumping up the route; he’s all over the place. This isn’t my game — free climbing really fast. My specialty is aid climbing. So I was glad I was tied to those bolts when he was up there doing his madness. Then we got to pitches 9 and 10, which are only 5.7, and we decided to simul-climb, without short-fixing. We’re climbing at the same time but I have all the gear — the pitons and hammers and pieces, so I’m moving slower. So I yell up. “Hey, can you slow down and fix the rope so I can pull myself up?” After a moment he says, “OK, come on up.” So I start pulling up the rope, hand over hand, like Batman used to do on the side of buildings on that cheesy TV show. I go up about 100 feet and reach a ledge. I look up and he’s gone another 70 feet to another ledge. He hasn’t clipped in any gear or made an anchor! He’s just standing there, bracing himself against the wall, with the rope tied to his harness. And that’s what I’m pulling on! We’re at the Grey Ledges. In about three hours we’ve done 1,500 feet of low angle climbing with very little pro. Now it’s my turn to lead The Shield itself, where the climbing turns very steep and harder. I’m actually allowed to place pro now! I’m using aiders and pulling on pieces as fast as I can. Here’s the difference between speed climbing and regular climbing: When you’re not speed climbing and you get to a bad piece you really think about it. You say you’re going to do everything you can to make sure you won’t fall here. But when you’re speed climbing you just clip it and keep on going. The interesting thing is that you’re not necessarily doing anything any more dangerous. Fear comes from being overwhelmed by the situation. When you are focused and confident the fear vanishes leaving the opportunity to move really fast. When I first started climbing I thought that a speed climb would really be fun and competitive, but you wouldn’t get the larger values of being on a wall for five days and sensing all that is around you. I couldn’t have been more wrong. Because when you are speed climbing you eliminate all the extra logistical stuff such as hauling the haul bag and dealing with ropes. You’re just whittling it down to the climbing itself. You’re up in this insane position, the overhanging Shield headwall, with 2,000 feet of air below you, and all you have is yourself and a light rack, a quart of water and a couple of candy bars. It’s a more pure experience, a more powerful experience, than hanging around on the wall for five days. You body also enters a zone. You’re going and going at a pretty good clip for hours. You’re not eating or drinking much so you might think that your body would collapse. Instead, it becomes really, really efficient. There can be some fatigue, and you will be tired the next day, but you are mentally more awake than you were when you started. The whole world is extremely sharp and clear. Cedar and I knew we were going fast. There was a Spanish team pretty far up on the wall when we started, but by the time we had done 20 pitches, they had moved only one. When we reach them they greet us with confused looks but then graciously let us “play through”. My Spanish is bad but I imagine they are saying to themselves “Where the hell did these guys come from?” Near the top of the Shield we looked at our watch and holy s---! We’re at nine and a half hours! The record’s 18 hours and we have only four pitches to go. And Cedar says, “Yeah, yeah, sure.” Well, he gets up there and he doesn’t put in a single piton and I’m thinking, “Well, he must have found a way to put in some other really good gear.” But then as I follow up the pitch, I start pulling out all this crappy gear. Suddenly I’m thinking that instead of getting the record I may end this by cleaning up my partners broken body from a ledge. But it didn’t happen. We got to the top in 10 hours and 58 minutes, knocking 7 hours and 7 minutes off the record. Only later did Cedar, who’s an experienced free climber, tell me that never in his life has he put in a piton. He’s done many routes where most people place handfuls of pitons, but Cedar Wright has never placed a single one, not to this day. Reaching the top I am on one of the most incredible highs of my life. A warm substance enters my veins and starts relentlessly pumping until my entire body is engulfed in a surge of energy. I can’t stop smiling. At this moment I understand - everything. After the climb, of course, the feeling passes and is eventually forgotten. But the energy waits, patiently, to be rediscovered on the next climb. 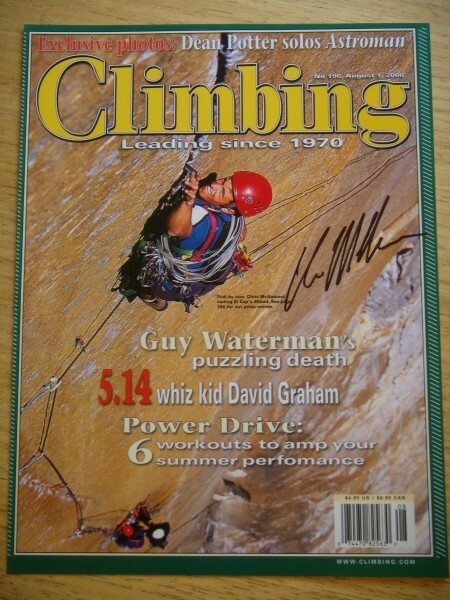 Outside Magazine has called Chris one of “the world’s finest aid climbers.” He’s the winner of the 1999 Bates Award from the American Alpine Club and founder of the American Safe Climbing Association, a nonprofit group that has replaced over 5000 dangerous anchor bolts. He is a graduate of UC Berkeley and serves on the board of the ASCA, and Rowell Legacy Committee. He has a rarely updated adventure journal, maintains BASEjumpingmovies.com, and also runs a Lake Tahoe home rental business. Someday this site needs a sticky index of trip reports organized by route. I know...I know...more good ideas than than there are manpower hours. good idea. i guess for now the plan is to just post trip reports in the forum. then go over to the route beta page and post a link to the forum. kinda clunky. what is the best way to index trip reports on the web? They have a really nice Trip Report indexing system that is split out by region, and fully searchable. A poster just clicks a link that says New TR, when starting thread, and it gives them a template to work with, so all the TR's have a standard outline format. And it makes it easy to post pics or whatever. Anyway, Jon and Tim are the cc.com horsecock kings, nice guys....worth picking their brains, or perhaps partnering up with. Just an idea. have fun man! nice TR - definitely sounds like Cedar is a madman. I always wondered how you guys aid so much faster than mortals... I guess that's the secret, just jump up the route without protection! Great TR to read, but scary. Gravity is one of the laws you can't break and get away with. More pro, bro, so you can stay around and keep this great site running. Just for fun, what is the current stat? At the beginning of last summer, you had been up the Stone 52 times, right? What is it now? I have been telling some of my patients about my 6 day epic, and then how you sent me an email saying, The route is pretty clean now. Did it Saturday afternoon... They laugh. I need to know your current trip total. i like the way cascade climber does that. i am going to consider that. my impression, at the time, was that cedar was a madman. but dean potter, hans, they all do the same stuff. none of them are really "mad" They are just really confident and talented free climbers. so on the surface it appears they are crazy but they are really in control. just like every climber's family probably thinks they are insane... but we all know that rock climbing, for the most part, is as dangerous as you make it. Awesome write up Chris, Thanks!!! One of the all-time records. Was this back when less than a dozen people were on Supertopo? Best thread revival of the year! Woot! Great stuff, thanks for sharing. Old school powerpoint, all but forgotten now - they use to call it "The Stance". He hasn't clipped in any gear or made an anchor! He's just standing there, bracing himself against the wall, with the rope tied to his harness. And that's what I'm pulling on! Nice bump Ben. What a cool write up. Amazing TR! Well worth a bump! Chris has become a much finer writer over the past 11 years. i was there that day! you guys were climbing faster than i could jug up our fixed lines with the extra cord for mr. rich! we couldn't believe that you were already that close to us after rapping onto the "chickenhead ledge". that was my first real exposure on the captain, and it was a total trip! that was a sweet day of climbing, right on! One thing I left out of the story is that on the summit, we realized we had another 13 hours to bang out another el cap route in the 24-hour "in a day" window. So we went to the Village Store, loaded up on cheese horns and candy bars, went back to the base of el cap, and started up the Zodiac. However, it was dark now and the adrenaline high of the Shield climb was fading fast. Three pitches into the Zodiac we were exhausted. We thought we could probably suffer through an all nighter on the Zodiac and get the two routes done in under 24. But we decided to go drink beer instead and bailed. The Shield is route number 7.